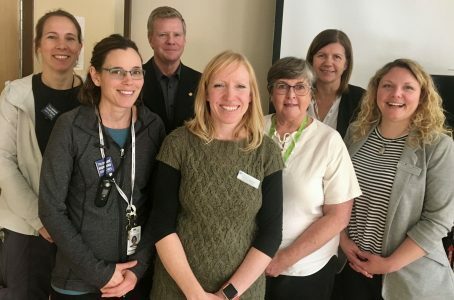 The annual recognition of World COPD Day took on special significance at Kemptville District Hospital (KDH) on November 21, 2018 as a large gathering of staff and members of the community celebrated the Grand Opening of the hospital’s new program for people with COPD (Chronic Obstructive Pulmonary Disease) and heart disease. Significant among the attendees were a number of members of the Perry family, who helped make the celebration possible by generously providing financial support for COPD programming at KDH in memory of their patriarch, the late Bob Perry. The new Cardiopulmonary Rehabilitation Program is offered in partnership with the Lanark Renfrew Lung Health Program and the University of Ottawa Heart Institute. It combines exercise, education, and support to help decrease the patient’s symptoms and increase her or his ability to function in daily life. Pictured (left to right), Cara Duhaime (KDH Physiotherapist), Tanya Collins (KDH Physiotherapist), John Jordan (Executive Director, Lanark Renfrew Health and Community Services), Christina Dolgowicz (Lung Health Coordinator, Lanark Renfrew Lung Health Program), Margaret Lenny (RN), Cathy Burke (KDH VP Nursing/Clinical Services), Krystin Gravelle (Respiratory Therapist). Frank Vassallo, KDH’s CEO, underscored the significance of bringing the program to North Grenville by pointing out that five percent of all global deaths annually are estimated to be caused by COPD. He expressed sincere thanks to the team at KDH and the Lanark Renfrew Lung Health Program for bringing the program to Kemptville – led by Cathy Burke, the hospital’s Vice President of Nursing and Clinical Services, and Christina Dolgowicz, Lung Health Coordinator with the Lanark Renfrew Lung Health Program, with tremendous support from KDH Physiotherapist, Tanya Collins, the entire KDH Physio department, and Krystin Gravelle, Respiratory Therapist with the lung health program. John Jordan, the Executive Director of Lanark Renfrew Health and Community Services (LRHCS), thanked the KDH team and commended Coordinator Christina Dolgowicz for helping to spread the Lung Health Program across the West Champlain region, with the result that 1,000 people are currently benefiting from these services. He noted that the program has proven very effective, with a greater than 50 percent reduction in emergency department visits by program participants. Next, Robert Noseworthy, the Chair of the KDH Foundation Board of Directors, spoke eloquently about the Perry family’s significant financial support for COPD programming at KDH over several years. 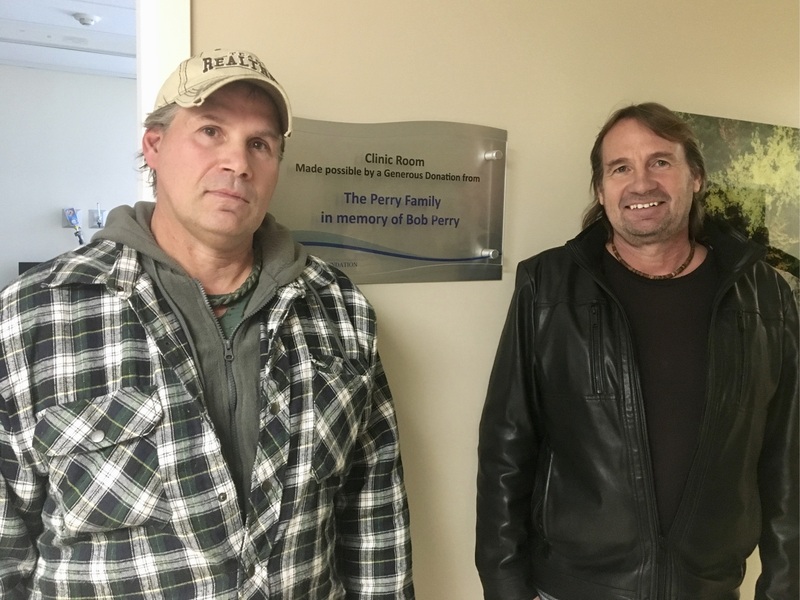 He noted the plaque bearing the Perry family name in the hospital’s new clinic wing.